Quirk Hotel’s rooftop bar, which opened in April, has had eyes popping and iPhones snapping. It’s almost impossible to believe that we have any rooftop bars. Only last year there were none, but by the summer, Richmonders will have three to choose from. Why didn’t anyone think of this sooner? We love a patio and one with a view is irresistible. Quirk Hotel beat everyone to the punch, and its pastel-striped bar, sleek white furniture and glass railing makes sipping a cocktail named the James River, made of tequila, Luxardo Maraschino and absinthe, seem like an effortlessly chic option with spectacular city views. A few blocks away, on top of Belle & James, Kabana Rooftop will have, when it opens, a 125-seat dining room, along with an outdoor patio and daybeds next to a wading pool. 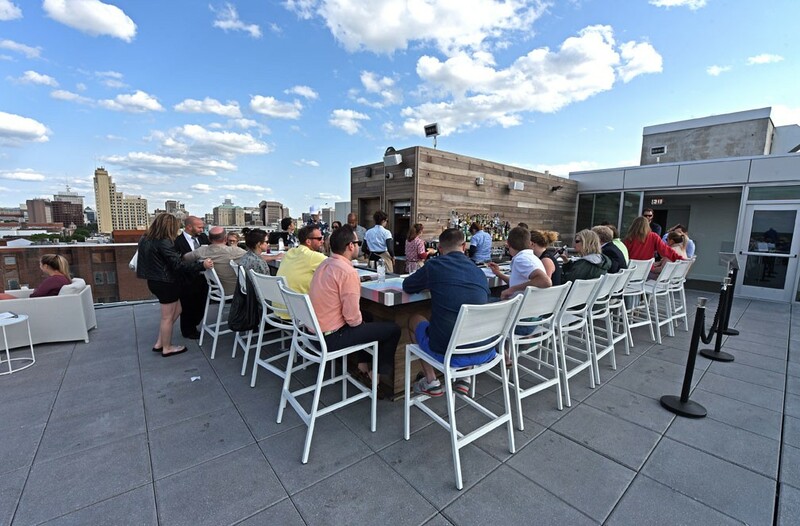 Adjacent to Scott’s Addition, the Hofheimer building, with Peter Chang’s new restaurant on its first floor, has an event rooftop spot with a spectacular view of the fireworks at The Diamond. Modular wooden furniture can be reconfigured at will and the bar, also temporary, can find a different perch every Thursday during May for Sunsets at the Hof, a series of nights open to the public that hopefully will be extended throughout the summer. CORRECTION: When this article first published, it neglected to mention that Kabana will have full table seating indoors and out. It will also have daybeds instead of draped cabanas.